Rancho Cordova, Calif., March 26, 2018 — For the 16th consecutive year, VSP Global’s call centers have been recognized for delivering excellent customer service by Service Quality Measurement Group (SQM), which awarded VSP Vision Care with its top honor as ‘Contact Center of the Year.’ In addition, Marchon Eyewear, Inc., a VSP Global company, was awarded the ‘Highest Customer Satisfaction by Industry – Business to Business’ and received ‘Contact Center World Class CX Certification’ along with its division Altair Eyewear. Criteria for the certification includes 80 percent or higher of customers getting their call resolved on the first call. Each year, SQM conducts surveys of customers and employees of more than 500 North American contact centers. Customers are asked to evaluate the call center on first call resolution and their overall satisfaction. Respectively, call center representatives are asked to rank their employer on first call resolution, customer and employee satisfaction. 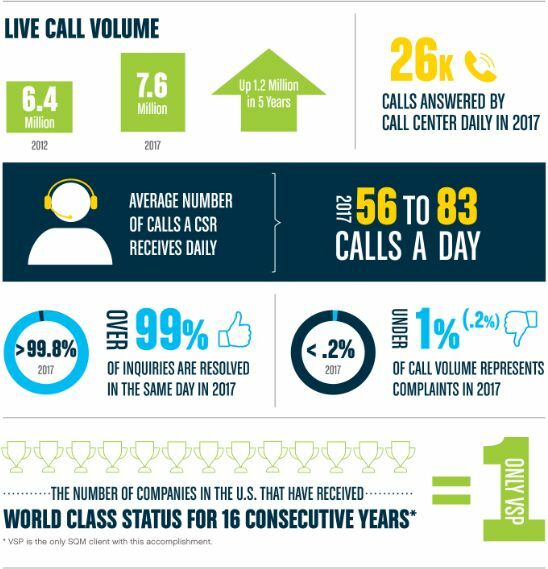 To achieve World Class status, among other criteria, a call center must perform at ‘top box’ satisfaction level or higher, on 80 percent or more of customer surveys. The call center with the highest combined customer and employee ‘top box’ rating earns the title of ‘Call Center of the Year. The awards will be accepted at SQM’s Annual Customer Experience Conference and Industry Awards held in Vernon, British Columbia on May 22-24, 2018.